Plot: Maria (Naomi Watts), Henry (Ewan McGregor) and their three sons begin their winter vacation in Thailand, looking forward to a few days in tropical paradise. But on the morning of December 26th, as the family relaxes around the pool after their Christmas festivities the night before, a terrifying roar rises up from the center of the earth. As Maria freezes in fear, a huge wall of black water races across the hotel grounds toward her. 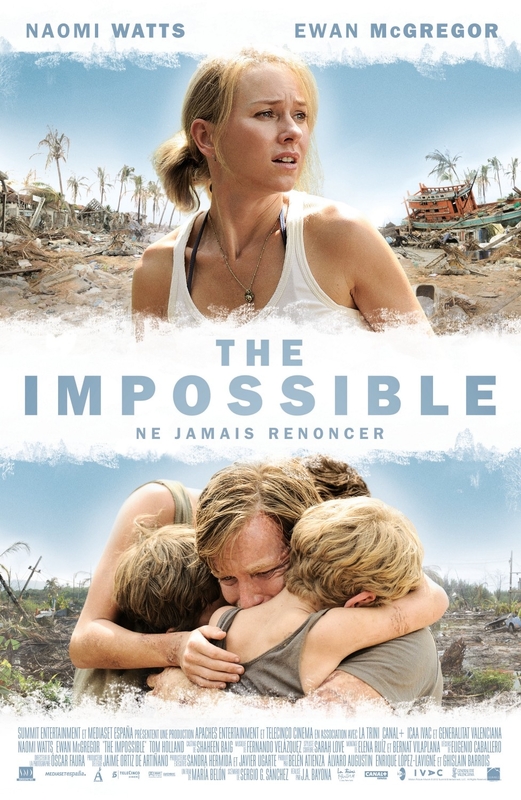 Based on a true story, THE IMPOSSIBLE is the unforgettable account of a family caught, with tens of thousands of strangers, in the mayhem of one of the worst natural catastrophes of our time. But the true-life terror is tempered by the unexpected displays of compassion, courage and simple kindness that Maria and her family encounter during the darkest hours of their lives. Both epic and intimate, devastating and uplifting, "The Impossible" is a journey to the core of the human heart.